The heavens finally opened, bringing thunderous rain tumbling from the sky and everyone is rejoicing. Since morning, the school has been a hive of activity with children and adults alike running around positioning strategic tubs, buckets and jerry cans to savour every magical drop. A river of muddy water is running through the school, bringing justification to the bridge that otherwise does nothing but span the dusty earth that takes me from my room to Dominic and Rose’s house. The week since I last wrote has been a roller coaster of emotions, of highs of lows, of heartbreak and happiness. And above all, I have never felt so humbled in all my life. One of the main reasons I wanted to come back this year (other than the fact that these visits have turned into annual pilgrimages) was to visit all of the sponsor children as the first wave finished up their fourth year of secondary school and it’s time to start thinking about their futures. Many children leave secondary school after their fourth year to pursue more vocational courses which helps to speed up their education and get them out in the workforce earning money sooner so that they can support themselves or their families or both. The amazing thing about this year’s visits has been that because the school term has ended, I am visiting each of them at their homes in their villages, meeting their families, and consequentially feeling the full weight of their gratitude for the first time. My first visit was with David, a boy whom we met in his final year of primary school in 2009. I’ve visited David several times at his secondary school and he is one of those boys who is always smiling, always upbeat and positive. I had no idea what to expect from meeting his family when Rose and I jumped on the back of a boda, the motorcycle taxis used for transport here. We rode over dirt roads for about half an hour before pulling up outside the crumbling mud hut that housed David and what remained of his family. We were warmly greeted by David who came beaming out to meet us, proudly welcoming us inside the hut. There we found his mother who shyly greeted me in Luganda and we exchanged greetings until my vocab ran out and Rose took over the conversation. 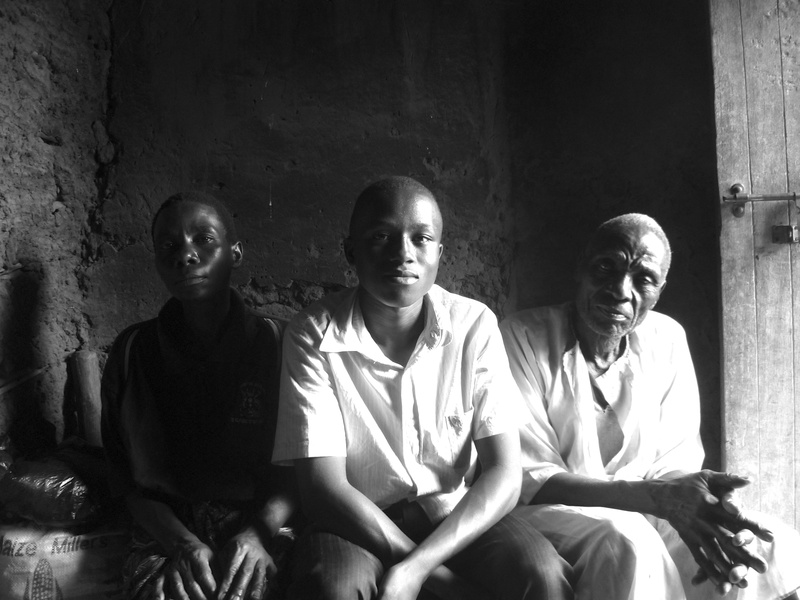 David’s grandfather appeared in the door, one of those incredible men who exudes dignity in spite of his torn, stained kanzu, the traditional dress of men in the village on special occasions. His face was weathered and crevassed by deep, deep lines and though his eyesight was failing, his eyes smiled as he took my hand and welcomed me to their home. We sat on brightly coloured mats on the dirt floor and David happily answered my questions as I tried to piece together their family story. His father had walked out when David was young, leaving his mother to bring up David and his four siblings alone. His grandfather took them in and to this day they all lived under his roof as he struggled to support them through sustenance farming. David, the shining star of the family, is on his way to becoming a doctor and the pride this brings his family is great. His grandfather didn’t speak a word of English but listened attentively as David and I conversed, nodding slowly, his pride evident as his grandson spoke so fluently in English with their foreign visitor. What hit me more than anything was that in spite of their poverty, their difficult circumstances and complete lack of anything beyond what was absolutely needed to survive, their spirits were high and their dignity intact as they presented us with gifts of tomatoes, avocados and a live chicken. It’s clear the hopes of the family lie on David’s shoulders but he just looks at me and grins and I know he will do them proud. The following day, Rose and I took Dominic’s car on one of our hilarious ‘girls road trips’, bumping our way along the world’s most atrocious roads to find other villages that house our children. We had with us Andrew, the stepbrother of Zakia, one of the sponsor girls, and his job was to guide us to his home village as Rose had never been. Two and a half hours later we had navigated our way through trees, along roads that wouldn’t pass as footpaths, through fields of rocks and long-horned cattle when Andrew pointed us down a path no more than a foot wide, studded with rocks and bordered by thick bush. I turned to Rose and laughed, ‘Is this really the right way? ?’ Rose shook her head with a smile and got out to speak to a passing tomato seller who pointed us back the way we had come saying we had gone completely in the wrong direction. Eventually we got hold of Zakia’s stepmother who told us to wait where we were and sent an uncle on a motorbike to shepherd us home. I have never been so happy to see someone as our two-wheeled guide, who expertly wove us through the plantations to the house. Along the way I performed my most impressive driving feat ever when he insisted I follow him in the car across a LAKE (!!) which barred our way. Arriving at the house, we were greeted by Zakia’s huge extended family who keep appearing without pause from behind a lace curtain that separated the front room from the rest of the house. A veritable feast was placed before us and then to my horror, they all disappeared, leaving me, Rose and Zakia alone to eat this lunch for hundreds. 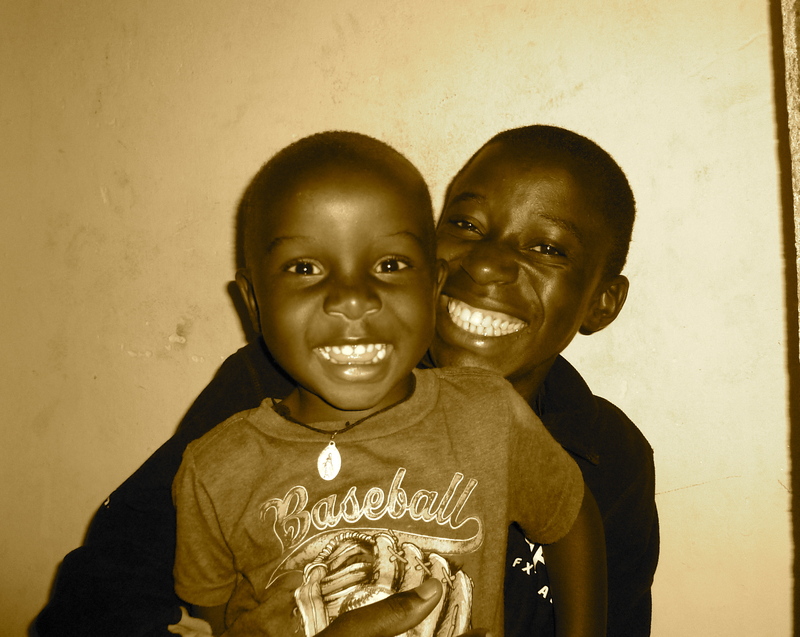 Zakia’s mother died of AIDS when she was 3 years old and her father is also HIV positive. Fortunately for Zakia, her stepmother is an incredibly kind and loving woman who took on Zakia and her siblings as her own, insisting they also go to KAASO along with her own children. The family flooded back to join us as we finished our meal and showered me with more gifts than I’d ever seen, woven bags and baskets and packages of eggs, beans, tomatoes, avocados and matooke, all carefully wrapped in banana leaves. It was overwhelming to say the least as they all came in turn and knelt before me to present their gifts. Zakia’s stepmother and her grandmother took my hands in theirs and hugged me close, thanking me in Luganda so much for helping their daughter. From there we stopped to visit Immy. Immy was one of my little favourites in 2009, an incredible singer and it was her that I would find each day waiting under the music tree to sing and sing and sing until the sun went down. She had prepared freshly squeezed mango & passionfruit juice for our arrival which she carefully poured for us and we sat down to catch up. We laughed and chatted and I met her mother and hilarious twin brothers as she told me proudly that she had now finished P7 and would next year be carrying on to secondary school. It’s hard to believe my little girl from under the music tree is all grown up. The last stop on our journey was to Munjera, another of the sponsor children. 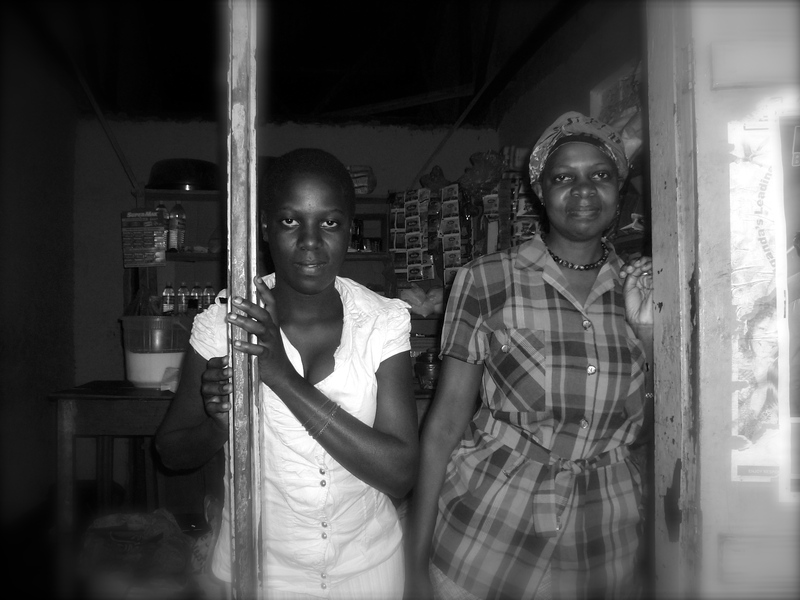 Munjera’s father died of AIDS and her mother has major health issues due to her HIV positive status. Munjera is a kind, softly spoken girl whom we visited at her mother’s small shop in the type of road-side town that you blink and you miss. We pulled up outside as the light was fading and sat in the dim light on a wooden bench between Munjera and her mother Alice. Munjera was looking well and seemed to come out of herself a little more in her home environment. I looked around the stacked shelves of sugar, washing powder, lollies, tea, bread and petroleum jelly as Munjera told me about her year at school and her dreams of becoming a vet. The mood was upbeat and positive until I turned my attention to Alice who told me she was ‘somehow not so fine.’ Her health had been up and down, so much so that she often had to close the store to sleep in the back room that served as her small home. 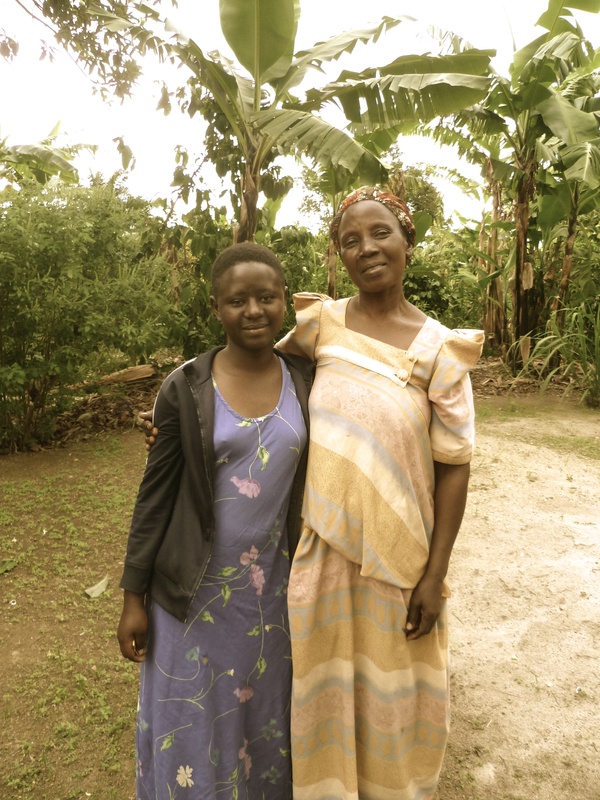 Any money she managed to earn through the shop was going into her doctor’s fees and it was hard to make ends meet. I asked about the store and how long she had had it and her response reduced me to tears. 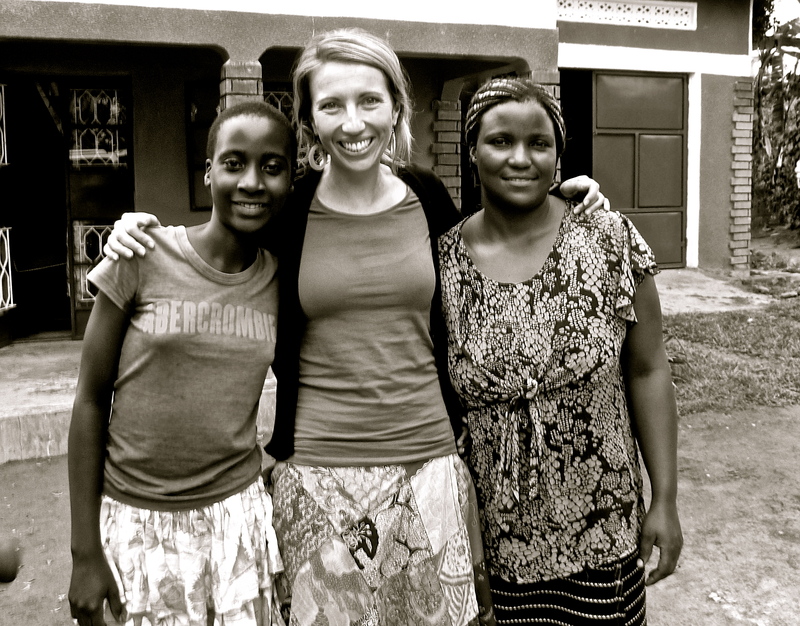 Two years ago, my aunts who sponsor Munjera had learned of her mother’s failing health and offered to help. They sent me some money which I discussed at length with Rose and she suggested we use it to help Alice set up a small business selling phone credit. In the last two years, Alice had sold enough to take the lease on this small shop and for the past 6 months had been making her living thanks so the initial donation from my aunts. I was blown away at her tenacity, her determination in the face of such adversity and just how hard people here worked to stay alive. The gratitude she showed for our support was immense and as we slowly pulled away in the darkness, I was left, once again, feeling humbled to the very core. Friday marked the end of term for KAASO and within a day we had gone from 600 children to just 100 as parents, friends and neighbours arrived on foot, on bodas and a rare few by car to pick up their children. It had been a long, emotional week and I was incredibly grateful to make the journey up to Kampala for a weekend of repose with Sonia and Paul who, as always, made me feel so welcome and filled me with amazing food and the odd G&T so that I left yesterday feeling refreshed and ready to take on the world once more. Yesterday I sat in the Kampala taxi park waiting for my bus to fill so that we could begin our long journey south when a woman came and sat next to me. ‘I wanted to thank you, teacher. My children tell me you are from KAASO.’ I looked up in surprise to find two of the KAASO children grinning over the backs of their seats. Their mother took my hand and thanked me again and again and I was completely confused until she told her story and it all made sense. She had been selected by an agency to fly to Dubai as a maid for wealthy families. She left her children at KAASO and made the journey eastwards, arriving to find the family she was there to work for spoke Arabic and not a word of English. Within three weeks they had sent her away and she was passed onto another family who, after three months, had still not paid her and she was penniless and desperate. Returning to the agency to ask for support, she found herself deported. ‘All this time, I could think only of my children and how they would survive as I had no money to send them and no way to support them. But thanks to KAASO, they survived. Ah, with no money – I paid no fees, nothing. But this school did not mind, they just looked after my children for nothing. I could not have made it without KAASO – this place really saved my life and I am forever grateful to you and everyone there.’ Tears streamed down her face as she spoke which of course set me off. As we finally pulled out of the taxi park, she took my hand and thanked me for all that we do at KAASO. I felt like saying it wasn’t me, that I was one tiny part of so many amazing people here but once again, I found myself on the receiving end of enormous gratitude intended for others. The past week of love and thanks I have been receiving belongs to the fabulous people sponsoring these children and I just try to pass it on and share it with them. Of course I wish everyone could come and experience it for themselves, but in the meantime, I will do all I can to bridge the gap. I arrived back at KAASO to a flood of hugs and cries of ‘Well-be back’ and it felt good to be home. I had a hilarious dinner with Rose, Dominic, Teacher Sarah and her two-year-old Jonah in the dark as the generator ran out of fuel the minute we sat down so we proceeded to eat by the light of Teacher Sarah’s phone. When Jonah fell asleep in her lap, she stood to leave, asking if we could continue using my torch but Henry had taken it to try and find fuel to refill the generator. Dominic, eyes lighting up, spotted his laptop and asked me to pass it over to him. He grinned as he started it up then turned the laptop to face the table. ‘And God said, ‘Let there be light!’ he exclaimed proudly, the table now brilliantly lit by the illuminated screen. He never fails to make me smile. Last night as I was crawling through the darkness under my mosquito net to get into bed, I found a letter waiting on my pillow. It was from Henry, the 16-year old boy I’ve been sponsoring for the last four years with my parents and it sums up why I am here and what keeps me going when times get hard, which can be often when you’re in a village far from home. Hope you are cool and good. Thanks for coming back to KAASO and loving us. Thanks so much for being there for us. I appreciate your endeavours and all that you have done to make life be life and not something else. I personally appreciate you for the change you’ve brought in my life. I’m grateful for all you have done to move me forward and bringing a smile to my face. It is only of now that I can realise my dreams being unfolded before me, and my future brightening. Thanks for the love and care you have always shown me. I’m grateful for everything you do and I promise that I will never let you down and I will always be there for you.